It was 10 January 2006. My mother, 67, suffered from last stages of bone cancer, and that morning her body had stiffened—presaging her imminent death. When the news reached Radhanath Swami, by late afternoon, he promised to be on her side at the earliest, surprising me: he was altering his schedule that was planned atleast months in advance. Usually, thousands awaited him every evening at gatherings where he spoke from the scriptures, but today someone special and intimate awaited him. His father, 85, was visiting him from Chicago after many years, and the two were to dine together that evening at Mr. Mafatlal’s bungalow in downtown Mumbai. Radhanath Swami’s driving two hours to suburban Mumbai to visit my mother—a little-known old dying lady, one amongst thousands of his students—meant his old father would undergo an indefinite fast—of the stomach and the heart. “Radhanath Swami is coming,” I had whispered to my mother. The pleasant shock triggered her instant recovery. Though she helplessly still lay in bed, her body loosened, and she started to converse once again. Radhanath Swami, upon reaching our humble dwelling, sat at my mother’s bedside. With reassuring affectionate eyes, his voice choking, Radhanath Swami expressed his gratitude to my mother for her services to her family, to devotees and to society. The monks then sang a prayer in unison. Meanwhile, my mother clenched Radhanath Swami’s right palm as a person helplessly hanging from a cliff clings to the rope that separates him/her from death. Thirty minutes passed by. Wanting to leave, now that my mother’s departure didn’t seem imminent, Radhanath Swami slipped his palm out of the tight grip it was in, only to have it snatched once again by my old mother. Now she held captive that palm, in more desperate determination than before. Radhanath Swami relented and sat down again. He waited for forty five minutes more, until he reluctantly broke loose of those shackles that ached for shelter. He had to be practical. But at a higher level, was my mother to let go of his shelter? And was Radhanath Swami to really abandon my mother? 24 January 2006. In the night, my mother was seen stretching out her arms, as she lay in bed, towards the framed photographs of Radha Krishna and Radhanath Swami hanging on the wall opposite. “Please take me,” she pleaded again and again. The next day she departed from this world. In the second week of February, my brothers and I went to the holy town of Mayapur to place our mother’s ashes in the holy Ganges. During this time Radhanath Swami was also in Mayapur for the annual meeting of the ISKCON leaders. A grueling schedule occupied his day, and also a part of his night. The meeting went from 7.00 a.m. to 7.00 p.m., breaking at lunchtime for half hour. At 7.00 p.m. he met pilgrims waiting for him outside the boardroom, and he returned to rest at about 11.00 p.m.
A day before the vidhi, the rites that accompany placing the ashes in the Ganges, I stole enough time of Radhanath Swami to inform him of the vidhi schedule. “We are starting at 10:30 a.m. tomorrow.” That was the time convenient for the head priest of Mayapur, Jananivas Prabhu. Radhanath Swami initially said nothing. But after a while, after I had returned to the guest house, Radhanath Swami’s secretary came running to me. 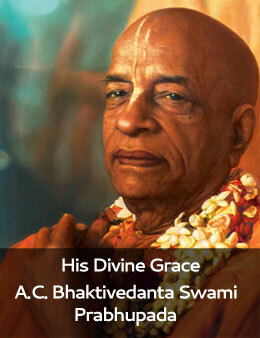 He informed what Radhanath Swami had just confided in him, “Why is Shyam Charan behaving in this way? I want to be there when his mother’s ashes are placed…” Radhanath Swami’s voice had trailed off in dejection. Immediately, I rushed to Jananivas Prabhu to reschedule the rites. He gladly agreed and it was decided that the vidhi rites would be held just when Radhanath Swami was free at lunch time the next day. The next day, despite her three sons personally present, my mother’s ashes merged into the current of the Ganges after falling off the divine palms of Radhanath Swami, those same palms which had soothed my mother’s soul a few weeks ago. Only Radhanath Swami can show such compassion! Thank you for sharing this incident which shows Radhanath Swami’s great compassion and love. Thank you for sharing this wonderful story of how Radhanath swami show compassion towards the dying soul. A very special & fortunate mother ! Touching incident, revealing the personal facet of a Guru. Very touching Prabhu, Thank you for sharing. Maharaj has so much compassion for devotees and even for there relatives… he sees the supersoul in everyone… Maharaj’s behaviour teaches us lot of things ! All Glories to maharaj ! Only great souls like Radhanath Swami can show so much compassion and kindness. Radhanath Swami is an epitome of compassion and humility! Very poignant story showing the compassion and kindness of HH Radhanath Swami.